On 31 August 2016, when the President of Mexico announced that he would receive Donald J. Trump that very day to hold a private meeting at the Official Residence of “Los Pinos”, few in Mexico believed what they were witnessing. Their own President had recognised the political stature of a foreign political figure who had consistently used racist and belligerent rhetoric against Mexico and its citizens. Although a comprehensive rationale for this invitation will probably remain absent in the immediate future —it was affirmed that Mexico’s Finance Minister promoted it in order to appease the then-Republican presidential candidate in a move that sought to neutralise the consequences of a potential Trump administration— the visit was, in itself, the expression of a particular strategic culture (or rather the lack thereof), i.e. the inability to prepare for the long run and the incomprehensible reliance on a set of static assumptions about the nature of the international system that no longer hold true in the complex strategic landscape of the 21st century. In his celebrated biographical work about the life and times of Niccolò Machiavelli, Maurizio Viroli presents the great Florentine statesmen as a figure tormented by the foresight of his own political thought. Cognisant of the stories of the great men and the societies of the classical past, Machiavelli anticipates the demise of the Florentine republic due to its inability to understand the nature of fortuna. In the Machiavellian tradition, fortuna represents both the uncertainty of political affairs and the structural forces that shape the options of statesmen and soldiers alike. Polities are subject to the negative influence of fortuna, when they are incapable of anticipating the nature of the structural forces that determine the evolution of political affairs. Significantly, when Machiavelli speaks about fortuna, he concedes that “she is the arbiter of half of our actions, but also that she leaves the other half, or close to it, for us to govern.” The counterpart of fortuna is virtù, an expression of political leadership that opposes human agency against the limitations imposed by the emergent trends of a specific strategic landscape. Like the currents of a river that needs to be funnelled by the action of farsighted men, fortuna can be tamed by the initiative of statesmen willing to commit their resources towards the art of political innovation. 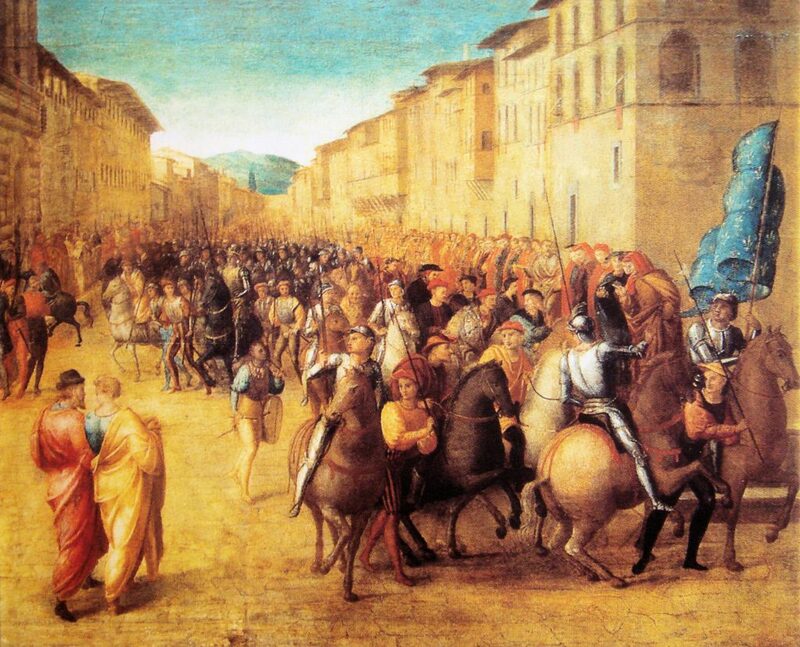 During the early days of the 16th century, in the context of a period of internal political turmoil and external systemic changes, the rulers of Florence failed in this supreme political test because they passively watched the evolution of a strategic environment that drastically reduced their political options. Unable to adapt their political behaviour to the new political realities of the early days of the modern world, they succumbed to the blind forces of fortuna and were left at the mercy of the monarchical enterprises of the princes of France and Spain. In the 21st century, fortuna is still relevant for those interested in grand-strategic matters. Central to the practice of grand strategy is states’ aspirations to assess the ever-changing nature of the international environment and the role of the unexpected in an opportune fashion. For those at the highest echelons of decision-making in any political community, this assessment is vital. It allows them to understand the tensions between the vital interests of their polity and the social, economic, and political trends that have the potential to limit or expand its options on the global stage. Like the Florentine citizens who witnessed the impetuous march of Charles VIII in the streets of Florence during the autumn of 1494, for many Mexicans, the presence of Trump in Mexico city signified genuine political indignation. A noted Mexican intellectual pointed out that the visit was a mistake of historical proportions saying: “You confront tyrants. You don’t appease them.” After Trump’s electoral victory, when some made an attempt to justify the decision of the Mexican government, another noted political analyst stated, “No…[President] Peña Nieto was not a visionary, he was a collaborationist.” However, prior to the elections, nobody in Mexico deemed Trump’s victory as a realistic possibility. Once the electoral results were known by the Mexican public, some believed, not without reason, that the country was now at the mercy of fortuna. Confronted (for the first time in decades) with the adversarial logic of international politics, Mexico’s political leadership has hitherto demonstrated that it is unable to articulate a consistent response. Commentators, political analysts, and relevant political figures still insist on the inevitability of the North American integration process, and in the strength of the commercial ties established through the North American Free Trade Agreement (NAFTA) between Canada, Mexico, and the United States. Their political imaginations refuse to deal with the paradigm shifts in the aftermath of the grand recession of 2008, the global power shifts from West to East, and the apparent erosion of the Pax Americana. At any rate, such thinking lacks strategic initiative and certainly is not grand-strategic. This is particularly surprising if one considers that Mexico has achieved in the last decades the (questionable) condition of a middle power with sufficient resources to play a more active role in the promotion of its own interests in the global arena. Two circumstances seem to explain this reluctance. On the one hand, a historical experience marked by the intervention of other powers in the internal affairs of Mexico oriented Mexico’s authoritarian political system towards a foreign policy defined by a genuine reliance on international law and multilateral institutions. On the other hand, Mexico’s reluctance is related to a more sombre aspect of the country’s recent history: the absence of a profound restructuring of its defence and security structures in the context of a fragile democratic consolidation process. Since Mexico’s security apparatus has historically been used to ensure domestic governance, the country’s defence and security institutions have evolved without any effective ties with their foreign policy counterparts. These two aspects of Mexico’s recent historical experience have generated a political setting in which the absence of a strategic vocabulary has hindered the ability of the country to navigate through the turbulent waters of today’s global realities. Amidst increasing levels of violence and social unrest, Mexico’s transition to democracy at the beginning of this century constituted an opportunity that has now been lost. Since 2006, the Mexican government has waged a “war” against organized crime with increasing political and humanitarian costs. To determine whether the armed violence witnessed in the country during the previous years is the expression of an internal armed conflict is, most surely, the matter of an additional debate. However, some scholars point that Mexico’s security landscape is now the expression of a security failure that has hindered the legitimacy of the country’s political system. It is aggravated by the corrupt practices of political actors who are as problematic and damaging to Mexico’s civic life as organized crime. In this context, Mexico has been ill-prepared to confront the challenges of paradigm shifts in the international landscape. Constantly preoccupied with the need to address domestic governance challenges and an eroding civic life, its decision-makers have paid little attention to the transformations of the international landscape. Ironically, Trump’s electoral victory has generated the space for a rare Machiavellian moment – an increasing realisation that Mexico’s governance and security challenges are deeply connected with an evolving domestic political reality that needs to be contested, and previous assumptions about the country’s own role in the world need to be questioned and reinvented. In doing so, the art of political innovation will be needed. Only by doing so effectively will Mexico put an end to the rule of fortuna over its own affairs. Alexis Herrera (@alexis_herreram) hails from Mexico and is a PhD candidate in the War Studies Department at King’s College London. He holds an MA in Law and Diplomacy from The Fletcher School, Tufts University.